After SYB and I were thwarted in our attempts to dine at Tia Pol, we were left with little time to settle upon an alternative that would deliver us to the the theater in time for our show. I’d just been to Bombay Talkie, so we ended up at the Chelsea outpost of Thai chainlet Spice, which had the benefit of being fast, cheap and a short block from the Joyce. 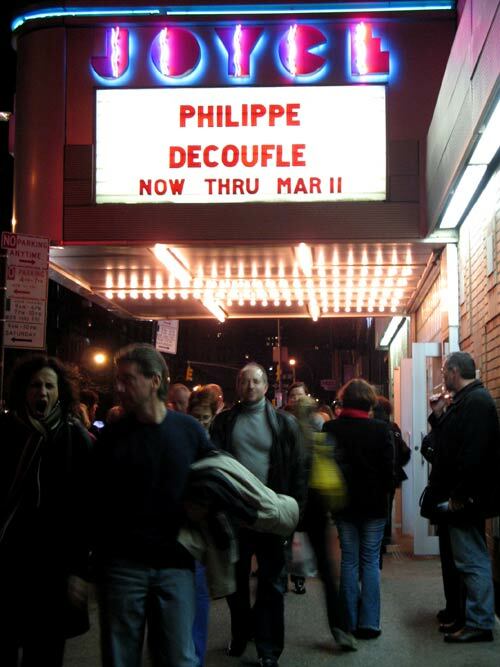 Tonight, one of the final performances in the week-long engagement of Philippe Decouflé‘s intimate and alluring Solo: Le doute m’habite (The Doubt Within Me). French-born Decouflé is an internationally renowned director, choreographer, and dancer. His choreography credits alone include the opening ceremonies for the 1992 Albertville Olympics, the 50th anniversary of the Cannes Film Festival in 1997, and the official bicentennial celebration of the French Revolution in 1989. On the pop cultural front, Decouflé is the director behind the music videos for Fine Young Cannibals’ “She Drives Me Crazy” and New Order’s “True Faith“. The arc of the show was semi-autobiographical, almost confessional, and drolly self-effacing: there was a montage of faded family photographs taken from the artist’s carefree youth, and through his adulthood to include his two daughters (and their mothers. Quelle sophistication, eh?) But the show did not dwell on sentimentality, focusing instead on Decouflé’s considerable performing skill (accompanied by trombonist and sometime ukelelist Joachim Latarjet) and multimedia theatrical work. The performance made use of projected video, light and shadows, transforming the stage into a literal kaleidoscope of movement and images. Decouflé skillfully manipulated imagery, employing numerous eye-popping strategies to reveal himself as a creative artist exploring new ideas. In my favorite sequence, Decouflé’s impressive technical arsenal was made to seem even more intricate as his movements were projected as shadows, and then inverted and re-projected as time-delayed doubles, triples, quadruples, and so on, until the entire screen was crowded with swirling, dancing Decouflés. 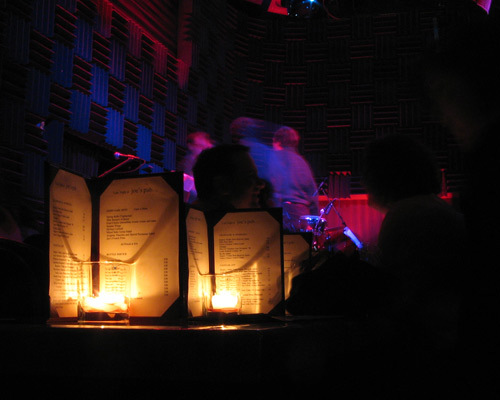 With some time still to spare, we cooled our heels at the bar at the Public, which was empty at this post-theater hour save for us, the bartender, Philip Seymour Hoffman and his cohorts. Just before our evening’s organizers M & L pulled up in their cab, the bartender sent us over a couple of G&Ts, which try as we might, we couldn’t quite bring ourselves to guzzle. Tragic waste. My first burlesque show! The stars of tonight’s program were the “World Famous Pontani Sisters,” who in 2005, were named the #1 burlesque attraction in the United States. The three showbiz “siblings” Angie, Tara and Helen Pontani — actually, blond Tara is a recruit from Detroit — have toured the world with their act, and were the subjects of Showy and 5’2″, a documentary by Rebecca Shapiro, chronicling their unique career and showbiz success, which premiered at the 2004 Cannes Film Festival. 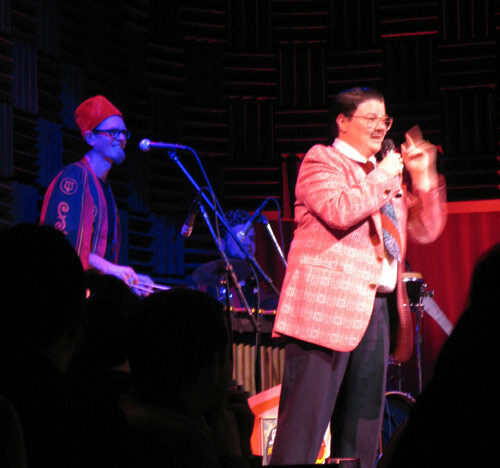 The evening was emceed by Murray Hill, who introduced the saucy acts by Trixie Little and the Evil Hate Monkey, Peekaboo Pointe and… one young and limber woman who looked strangely familiar. Hmm. As Miss Harvest Moon arched backwards into a full bridge, reached upside-down with her mouth for a champagne glass set on the stage, and drained its contents without spilling a single drop — all to the howls of an appreciative audience — it occurred to me that I first saw Miss Harvest as a guest at MC’s holiday party in December. Though admittedly, not quite so very much of her. Haha! I love New York. My local Starbucks has been closed all week. Every morning on my way to the Lincoln Center subway station, I come across at least a couple of people poised perplexedly before of the brown-papered window. Young professionals, bleary-eyed mothers and their Peg-Peregos, ABC Studios staffers, Reebok Sports Club members… the scene always plays out the same way: a double-take, a narrow-eyed reading of the posted sign, a second, sometimes a third, reading, and a palm shielded squint inside the darkened windows. How can this be? Over the next three seconds: disbelief becomes dismay, followed by a quiet, slow-building desperation. Now where will I get my soy chai frappuccino/half-caf mocha/nonfat triple caramel macchiato? Where? Where?! 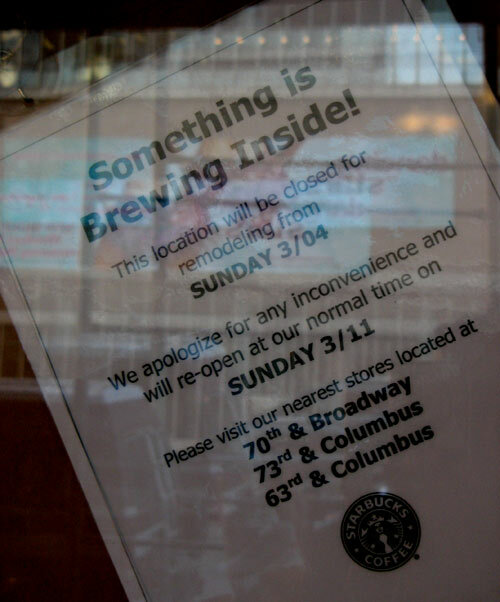 Incidentally, the changes “brewing inside” are to convert the Columbus/67th Street location to a 24-hour(!) Starbucks. Which, given the sugar/caffeine content of their concoctions, makes some sense. Interesting piece in the New York Times on the coffee bars in Brazil’s Rio de Janiero, a country whose total coffee consumption is second only to the United States. Naturally, SBUX is all over that, opening its first two shops in São Paulo last November, making Brazil the 38th country to host the chain.